Eddie Delahunt: Catching a wave..
ot long after wandering musician Eddie Delahunt mustered out of the Irish Merchant Marine, he caught the big immigration wave to America. Lo and behold, the Dublin boy washed up in landlocked Missouri! Delahunt knew nary a soul when he arrived in America in 1989, with rucksack in hand and guitar over his shoulder. But the natives were starving for new and younger sounds from the country of their grandparents. A two-week gig at Harling's Pub in Kansas City turned into a hundred gigs. The gigs turned into CDs, parades, regional festivals and radio shows. 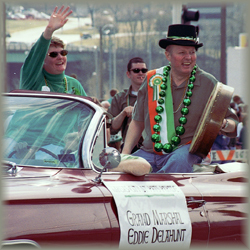 Eddie's workingman concoction of traditional Irish ballads, energized guitar riffs, and original lyrics and tunes have made him an adopted native son and something of a household name in and around Kansas City (if your household includes pictures of the Pope and Jack Kennedy). His live and studio recordings have sold thousands. His latest CD 'WHISKEY,WAKES & WEDDINGS' has been welcomed as he revisits traditional favorites complimented with some newer songs ! Eddie's release 'WALTZING WITH NANCY' was received with rave revues . Before 'Waltzing with Nancy' he released '20 Years A Growin' his favorites over his time spent entertaining in the USA. His 2007 release 'Triur' has been ecstatically welcomed by listening fans old and new . Original compositions featured on his 2006 release, 'Original Sing', are requested over and over again at his regular performances, concerts and festivals. Released in 2005 was 'Alive at O'Dowd's'. This expertly mastered CD will have you participating and clapping along as if you were a part of the crowd. Another CD, 'Travelin', celebrates the notions of freedom and exploration, and recalls the trepidation and lonesomeness that are the realities of emigration. The CD covers some old Irish and English ballads and introduces a handful of grand new Delahunt songs. "Writing is a gift that is rewarded with the compliment of someone who identifies their experiences with yours in your songs", Delahunt explains. "Performing is the best feeling of all," says Eddie. "It's never the same twice. I never use a set list as one song begets another and one crowd is, of course, different than another. A nice applause is always appreciated, but putting a smile on someone's face or a tear in their eye--that's magic!" Eddie is an honoree at the Ingram's Magazine 2014 class of "50 Missourians You Should Know."